Born in Boston, Sarah Lamb trained at Boston Ballet School with Madame Tatiana Nicolaevna Legat. She was a Presidential Scholar in the Arts, 1998, awarded a gold medal by President Clinton. With Legat's coaching she won three silver medals at the International Ballet Competition in Nagoya, Japan, 1999, the Sixth New York City IBC, 2000, and the US IBC, 2002. 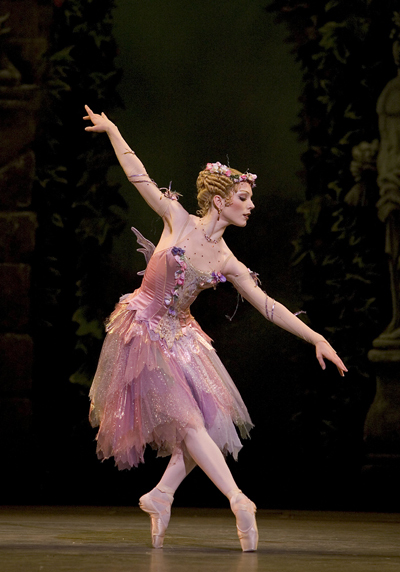 She joined Boston Ballet in 1998 and was promoted to Soloist, 2001, and Principal, 2003. Her repertory included Odette/Odile, Juliet, Lise, Myrtha, Gamzatti, Olga (Onegin), Princess Florine, Balanchine's Ballo Della Regina and Stars and Stripes, In the middle, somewhat elevated and David Dawson's The Grey Area. She has created a role in Alastair Marriott's Tanglewood. Q/	Why did you leave America, where you were already a principal ? R/	I didn't see myself capable of developing into the artist I wanted to be if I stayed in the US. None of the other US companies attracted me. Funding for art and ballet is lacking so much in the US, that no Artistic Director seems capable of realising what he or she wants. The money just isn't there, and the compromises are unfortunately ultimately realised by the dancers. I felt that if I wanted to pursue a career in ballet, I would have to go to Europe. I was offered a principal contract with the Het Nationale Ballet and was very honoured, it was a difficult decision, but I chose to join the Royal Ballet as a First Soloist. Q/	Could you elaborate on what you call "holding the forms", or plastique ? R/	Great art or high art is able to communicate without speech. Even if one has never heard Western music before, one will understand something listening to Mozart. Understanding plastique is not innate. With Madame Tatiana Legat I studied mime from a young age, it became natural, and eventually lost its awkwardness. When mime is done well, it is no longer "mime", it is still dance. The articulation of the fingers, the angle of the head, the tilt of the body, these are all vital to the dancer and the dance. If one does it wholeheartedly, with one's entire being, then the public will recognise human emotion with every gesture and it will speak to everyone in the audience. Madame Legat taught me that the fingertips, épaulement, and use of the arms are the voice, the punctuation, the nuances that must all emanate from the centre in order to express oneself. Q/	What do you think about the craze for picking up the leg ? R/	Once the public see something new, they expect to see it again. A level is expected once it is introduced. Sport has changed so much in fifty years, and of course ballet is not a sport but it is extremely physically demanding, more than many sports I am sure! It is only natural that we continue to put demands on the body and expect more from ourselves. One doesn't expect the men to start jumping lower or turning less, the same would go for women. Whenever something new is introduced, such as hyper-flexibility, there will be people who do not understand it. Q/	What do you think about teaching at the present time ? R/	I have seen a few really promising and talented young dancers, but unfortunately, I have seen many many young dancers who seem to have no training. Many top schools try to get the students with the best physiques, but they lack strength, coordination and musicality, or any combination thereof. At my school we were not picked for our physiques, it is not considered a top school, but we had an incredible teacher with Madame Legat. An incredible teacher will be able to extract musicality, coordination and love of movement from the students as well as imbue the vital core strength and discipline that is essential for a dancer. Of course it is tiresome to inculpate teachers and schools. Why don't we have more Nobel Prize winners from School X, or more Rhodes Scholars from School Y? The teachers are a part of the equation, but genetics is the other part. It is incumbent upon us to realise that a great dancer is not a common phenomenon. The rarity of this is what makes it so special, otherwise we wouldn't have that wonderful feeling when we do witness something truly great. I cannot say that schools have become worse, or teachers aren't as good as they once were. However, it is amazing to think that the classes Johansson or Petipa used to give at the Maryinskii would last hours, and the amount of work they did is inconceivable to me. We are also entering a phase in society where "all touching is bad", and therefore teachers are accused of being abusive when they correct children. It is absolutely ridiculous. Ballet is hard, it is very difficult. Technology has made so much in our lives easier, but ballet has not changed much at all. Ballet will always be a mental and physical challenge. if people want their children to have easy "fun", they should not enroll them in ballet. Q/	How does Tatiana Legat teach? R/	Madame Legat has an incredible legacy and history. Her grandfather, Nicholas Legat, and great-uncle Sergei Legat, were choreographers, dancers, artists, and were a great influence on the teaching method known as the "Vaganova Method". Madame Legat has a very pure Vaganova class, meaning she will never mix or omit combinations at the barre - rond de jambe en l'air is never combined with fondu développé etc. She emphasises core strength, and everyone knows this is vital. Years before Pilates had been popularised, she understood which muscles are imperative for a dancer. She would often give combinations that seemed nearly impossible to perform, but that is why class is so important, especially a challenging class. Stage is not the place to feel nervous about one's technique, therefore the more one trains in class and rehearsal, the easier it will be to perform. A class that is easy and comfortable will do nothing to enhance the technique of the student. Q/	What are your observations on dancing the Sylphide ? R/	Bournonville, Johansson, Vaganova all are linked and this relationship was demonstrated to me in learning and performig the choreography. One has to have a solid grounding to perform Bournonville well, it is very difficult to sustain the ballon and requires strong feet and legs. Vaganova would use bigger port de bras and more pronouned épaulement, but Bournonville keeps much of the upper body held as if floating above legs that are working constantly. The Vaganova training in me wanted to make everything bigger, thinking that that would be "better" or more interesting. Bournonville asks for movement without extreme allongé; it is not that one is better than the other, simply different. The Sylph is not simply sweetness and light, something of a man's dream. All dreams have mystery and unknown within them, and she has this in her eyes. James sees her, and he doesn't understand her, how is she possible? How is she real? She invites him with her eyes, kind and warm, attractive in her childlike innocence. But underneath is a temptress, she wants him and knows that she can make herself absolutely irresistible. The Sylph is the foil to Effie's grounded woman. The life James will have with Effie is predictable, the life with the Sylph is the unknown, the mystery, the attraction of the risk and the adventure. She will never be predictable the way Effie will always be. Q/	What are your views on Balanchine ? R/	The few ballets or pas de deux that I have danced, I loved. I performed Tchaikovsky Pas de deuxat the New York International Ballet Competition in 2000, Stars and Stripes with Ethan Stiefel, and Ballo della Regina with Yury Yanowsky in 2003. I have worked with Vicky Simon and Merrill Ashley, for whom I have great respect and affection. I love dancing his choreography for its musicality and technical challenge. It is difficult, and I couldn't take a Balanchine-style class every day, but I think it is vital to have in the repertory. Merrill was a beautiful Balanchine ballerina, she had an intelligence, she could take what he said, and apply it to herself so that it worked. Q/	Does the classical dance have a future? R/	I hope it does. I do not know if it will survive. I worry about the training, I worry that a lot of dancers become teachers because they cannot dance anymore, not because they have talent in teaching, and the two are very different. Also, I look at the audience, at the people who really love ballet, who go to performances multiple times to see different dancers take on the leading roles, and they are almost all over 40 or 50 years of age. There is also the question of expense, how could I expect an eighteen-year-old to go to the ballet even once? The stalls are astronomically expensive, and one has to be dedicated to seek out the standing room tickets. Q/	What is your attitude to music ? R/	I wish I had continued playing the violin or piano, I wish I could still read music. I was too active when I started with those instruments, and I always preferred dancing to standing or sitting. I react to music, I physically react to it, I get chills when I hear something that I love. I know a lot of dancers feel music is secondary, and I often complain that the tempi are too fast or slow, but dancers should be married to the music. The dance should be an integral part of the music and vice versa. I do not cry easily but I remember the first time I saw Eugene Onegin, I was 13 years old, and I cried, I couldn't help it, the final pas de deux was so completely and perfectly represented by the music, the choreography so marvelous. That was one of those moments when I knew that I wanted to be a dancer more than anything.